Samsung Electronics and 11 large South Korean companies pledged to expand the use of renewable energy and called for the creation of a system that would enable businesses to purchase renewable energy during an energy forum in Seoul on Thursday. The companies also have a number of global clients and partners that belong to RE100, a global campaign to go 100 percent renewable in offices, buildings and production plants. The 155 member companies include Apple, BMW, Google, Facebook, Coca-Cola, Bloomberg, Burberry, General Motors and Goldman Sachs. “Samsung Electronics in its business-to-business deals is gradually being pressed by global clients to use renewable energy for the production of the parts we supply,” said Kim Ji-young, a chief of Samsung Electronics’ global EHS center, during the forum at the National Assembly. Other Korean businesses faced similar calls this year, including LG Chem from BMW and SK hynix from Apple. Despite the increasing pressure from global clients, Korean companies face limitations in the extent to which they can replace their existing power sources with renewables. In Korea, the state-run Korea Electric Power Corporation -- the only power provider here -- is unable to classify power according to how it was generated. That is, Kepco cannot tell consumers whether power comes from renewable sources, coal, liquefied natural gas or nuclear energy. This is because the power provider has a complex internal classification mechanism for energy sources. When it sells energy generated only from renewable sources, it must charge higher prices, according to Kepco. Kepco’s policies affect both Samsung Electronics and SK hynix, which announced plans this year to use 100 percent renewable energy in other parts of the world, but were forced to exclude their plants in Korea from this commitment. In the joint statement, the companies said, “We hope a system (enabling us) to purchase renewable energy is created in line with the global trends,” which would require the passage of legislation. In July, Rep. Lee Won-wook of the ruling Democratic Party proposed a bill that would require Kepco to distinguish between different energy sources. 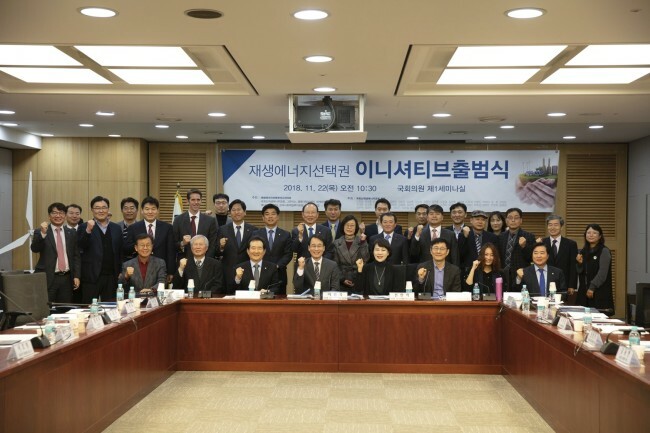 During the forum, an initiative for the right to purchase renewable energy was launched together with the legislative branch’s Renewable Energy Forum led by Rep. Lee and six civic groups, including Greenpeace, the Korea Sustainability Investing Forum and the World Wide Fund for Nature. The parties to the initiative also expressed their support for Lee’s bill, saying it could be a starting point for the development of more advanced infrastructure to make it possible to purchase renewable energy in the future, the members said. In the US and Europe, companies like Apple and Google can make long-term power-purchase agreements with private power suppliers for the purchase of renewable energy. This type of long-term contract allows companies to be provided with renewable energy in a stable manner and at affordable prices. “(There is) a long way to go before Korean companies can use such advanced infrastructure. But the initiative launched today is still very meaningful as it can be a steppingstone to further develop Korea’s renewable energy system,” said Lee Jong-oh, director of local civic group Korea Sustainability Investing Forum.